Want to know what your grandparents did for fun? 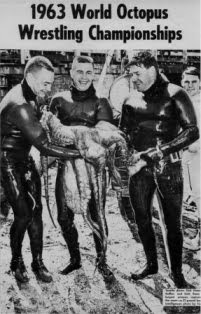 According to the Wikipedia entry, Octopus wrestling was all the rage in the 1960s. (Really?) 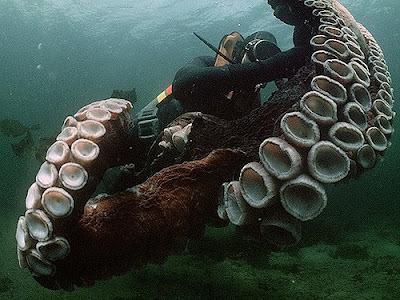 Divers would plunge into the ocean, grab an octopus and attempt to drag it to the surface. Anyone who took the sport seriously accomplished this feat without the help of an artificial breathing apparatus. I realize it all sounds like a loathsome sport but it’s really more fun than hunting some poor harmless creature. When you wrestle and kill an octopus, you’re ridding the marine world of a treacherous enemy. And you’d better watch your step, too. For there’s no such thing as a reckless octopus hunter. You’re either careful or dead. A treacherous enemy? I find them rather cuddly! I think that they are cute! And really smart too! They only seem "dangerous" because they are following their instincts so that they can eat! Your'e welcome. Glad you liked it. Or defend themselves from the crazy person that attacked them while they were minding their own buiseness. Okay, for the record, Anonymous 1;49 is me. I'm not used the library's computer. sorry if i'm annoying someone. anyone ever read the most dangerous game. well this guys the next general zaroff. i bet 1 cent on it! gymnast20: I'm in full defense of the octopus because. 1. The octopus drowned the human in self-defense. 3. What would you do in the same situation? Try and talk it out? Not likely. What an unfortunate sport. I never understood how people consider killing creatures "fun." "Oh, I just have such a dandy time octopus wrestling! You really should try it sometime, it's just dandy!" says Marlene with a playful smile. "Why thank you for introducing me to this fantastical game! What could be more splendid then squishing the life from innocent creatures, Marlene?" Janet replies, a laugh escaping from her lips. On a slightly irrelevant side note, "Octopus Wrestling" sounds like a band name. Anyone agree? Anonymous Weekly Blogger; I does sound like a band name! Lucy Mystere: Did you take the test yet? Did the teacher dress as a chicken? gymnast20: You have been forgiven. Hey, I read the Most Dangerous Game in ELA last year!!! we had to do all sorts of weird stuff like find the inner meaning. and the inner-inner meaning. and the inner-inner-inner meaning... eventually i went to my teacher and said that there were no more meanings, except of course that th story was discussing the ongoing battle between llamas and alpacas. I LOVE llamas!! they're winning. Alpacas are evil!!!!! An octopus only swims in the oceans, minding its own business and not hurting any human. I guess some humans just have to constantly remind themselves and others that they have power over other animals... sort of like "The Hunger Games." Oh yeah, I want to do that sport. Woohoo dragging poor, almost harmless, giant, inking creatures up where they might suffocate sound like so much fun! Yipee! But seriously, I think that's taking it to the extremes, don't you? * Hey Jim, cow tippin' is getting a lil' boring. I know! Lets go wrestle an octopus! * Woohoo! I'll go get my scuba mask and arm floaties!! Reel Dancer: you must have encountered an evil llama. One who had gone over to the alpacas side!!! and holdup before everyone starts telling me nice alpaca experience: I have no doubt that there are nice alpacas, but most are evil. poor poor octupi :( Thay're so so smart and people think that they're dumb... it makes me mad, cool info though! WHAT?!?!?!? The world (sea?) does NOT need to be rid of octopuses! It's like saying, oh, cheetahs kill lots of little *innocent* gazelles, therefore all cheetahs need to die! And the killing off of one species throws the whole ecosystem off wack (except ants, which are vile, aweful, and extremely unnerving to look at up close [Sorry-ish, ant lover people]). Capybara: you don't worry about offending me by saying bad things about ants. I hate them. I used to live in South Carolina; land of Fireants. Those things are well named to! If ONE bites you, you're in for it 'cause that means others will too and then it feels like leg (or wherever you are bitten) is on fire! One word; ouch. D:( a dangerous and loathsome beast that plagues the marine habitat, eh? It is either kill or be killed and if the octopus doesn't kill the person, then the person will kill the octopus, survival is a needed trait! If someone attacks a wild animal and dies because that animal was more intelligent or just plain stronger than them, who is the person really at fault here??? capybara- without ants, a great deal of decomposition would remain undone. Ants keep our forests cleaner and aid the natural energy cycle. not just the ones that are easy to like.. Anonymous 8:36; I don't hate ALL ants.....just the ones that try to kill me. i am a vegetarin.....this is very wrong, what if dinosars were still around and THEY enjoyed hurting US. how would that sound to us???? Sorry, I have this whole Llamas verses Alpacas thing going on. Ya see the alpacas enslaved the llamas and well it's kinda a long story involving mulch. and rakes. and mulch. and bunk beds. and mulch. and toilets. and mulch. and tents. and mulch and a dude called Albert. and Santa. and a swing. and more mulch. It's all in the LLodessy(or will be when I finish) which will be in a while. I'm stuck on a word that rhymes with vegetable. besides the hills in England of course. YES!!! I live in Tevas, the other land of fireants where babies can get killed by just going out itno their back yards and getting swarmed by fireants.... See my point, anybody? Remind me why humans are considered the most intelligent species? Mushroom Cloud: the trouble with finding the inner inner inner meaning of stories is that it feels too much like dissecting something. ANd to dissect it kills it...hopefully, otherwise it's called vivisecting and is illegal (I think and hope). By the way, are alpacas as evil as sheep? "Hawaiian lava sledding (Hawaiian: heʻe hōlua, "sled surfing") is a traditional sport of the Native Hawaiians. Similar to wave surfing, heʻe hōlua involves the use of a narrow (12 ft/3.7 m long, 6 in/15 cm wide) wooden sled (papa hōlua). The sled is used standing up, lying down, or kneeling, to ride down man-made or naturally occurring courses (kahua hōlua) of rock, often reaching speeds of 50 mph (80 km/h) or greater. In the past, Hawaiian lava sledding was considered both a sport and a religious ritual for honoring the gods."